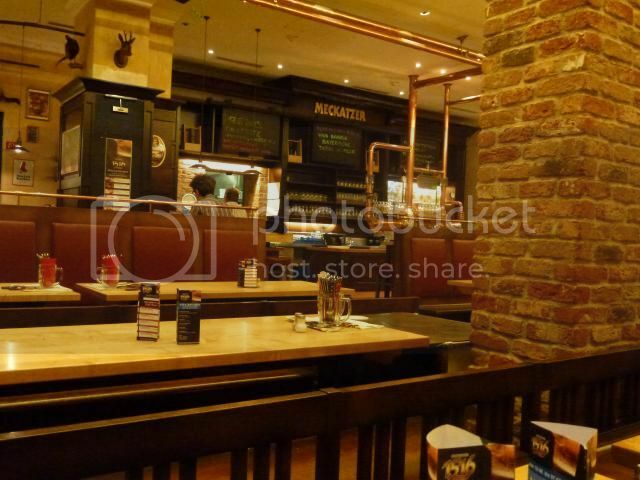 Pubs at railway stations are, more often than not, not partcularly nice places to hang out. There are people waiting for delayed trains, some customers having a drink or a bite to eat before either boarding the train or finding their way home by other means. And there are people hanging around with nowhere in particular to go. At Augsburg station, there seemed to be a few regular customers, apart from that the quite cavernous pub/restaurant/waiting room was largely empty. When I passed by earlier in the day, the outside tables were all occupied, but by now they seemed to have gone home – or perhaps found a beer garden elsewhere. They have only one home brew, an unfiltered Zwickl . Yet another Helles. OK, I guess I’ll give it a try. If looks were everything, this beer would score a perfect 10. This is a place where the marketing men in their slightly too large suits should go to set up their photo shoots. The taste, however, was more on the dull side. Malt and cereals, some aroma hops, but in low amounts. And no crispness in the finish. Time to find the train back to Munich, no need for another round. Friendly service. And there are beers from the Meckatzer brewery, too. And of course they do food. Meat and potatoes. Augsburg is a pretty town, and deserves more than a few hours. For some reason they have decided to dig up most of the streets this summer. I found it tricky to find my way on the bike, I do not envy anyone who needs to navigate there with a car. I returned my bike at the station and walked through the Old Town towards my next destination, the brewpub König von Flandern. I am definitely back on the tourist track here, with menus in various languages. A cozy place with nooks and crannies, but I headed for the terrace at the back on this balmy evening. 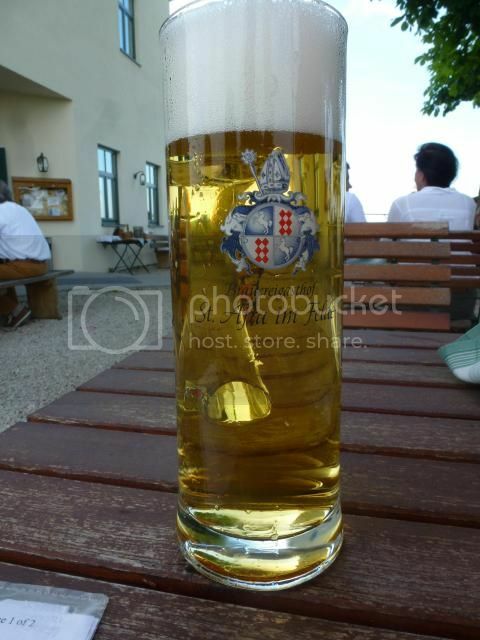 The first beer, the Helles, hit the spot. Fresh, aromatic hops, discreet bitter tail. More of a Pilsener, if you ask me. Cellar temperature, crisp and refreshing. I need something to eat, and a salad would be just the thing. I order a Wurstsalad, but I did not get quite what I expected. 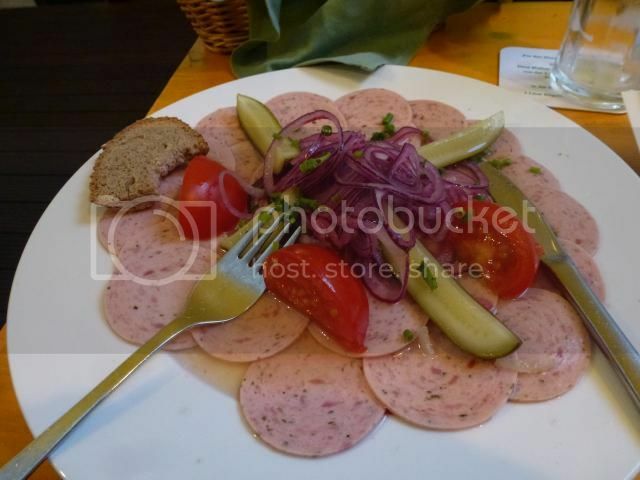 A plate covered with sliced sausage, marinated in a vinegar dressing. Topped with sliced red onion and pickles. This would not be considered a salad anywhere else on the planet. The bread was good, though. Baked with leftovers from the brewing. A beer with a name ending in -tor usually means a bock. 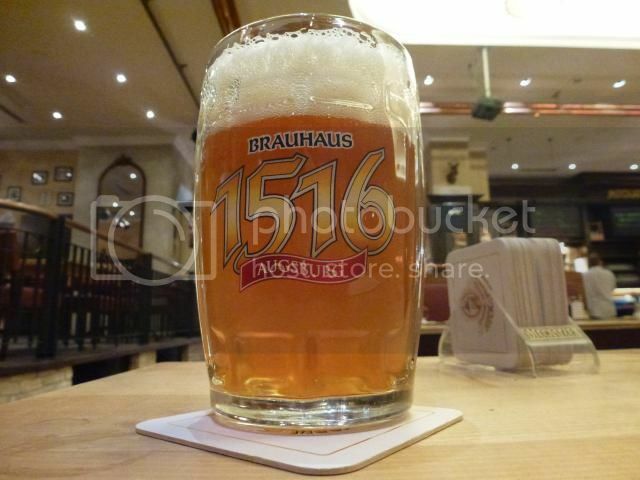 These brews are often seasonal, with the poüring of the first glasses of the Maibock being a big event. The King of Flanders, however, had the bock available even in June. The Alligator has a very dark brown color. It is soft, sweet and malty. Did I say sweet? Very sweet. Saccarine sweet. An opportunity lost. 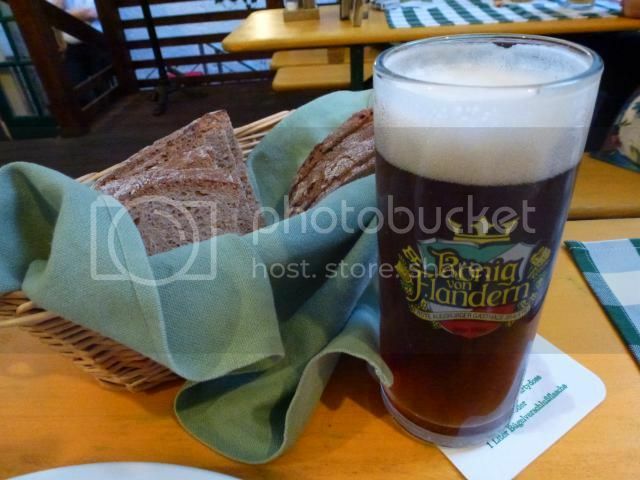 But overall – a nice place, friendly service, just stick to the Helles if you want a beer. And if your have doubts about the menu, you could always ask. Or just have another pork knuckle. Venturing further afield from Munich, I found myself on the train to Augsburg. 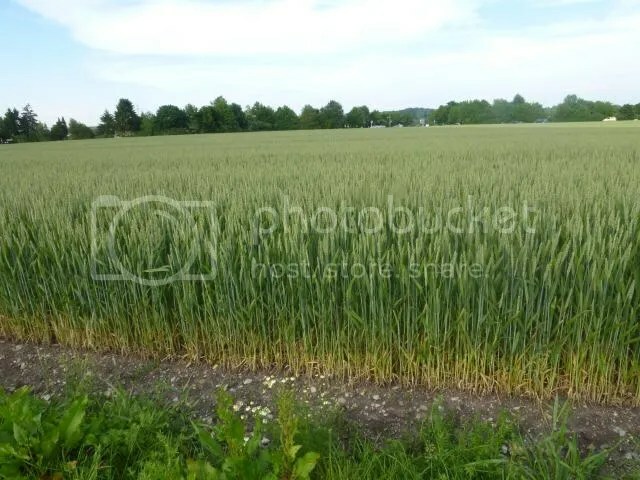 Patches of fields, forests and solar power plants – the Bavarian blend of traditional and modern. 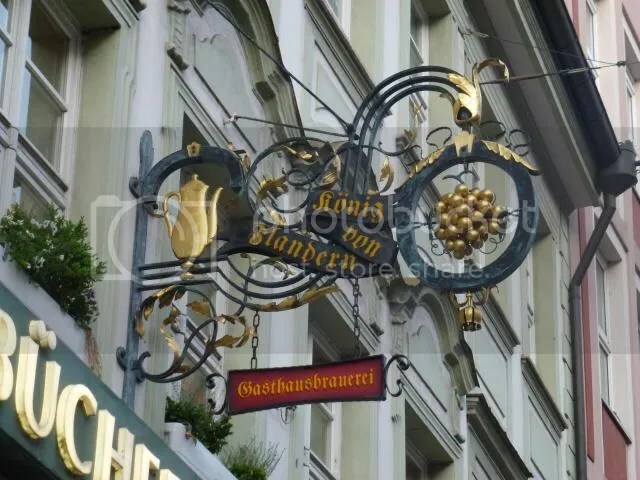 Just half an hour or so from Munich, this is not a town I know much about, except some vague connections to Martin Luther in a largely forgotten lesson in the history of religion. I did not look around for the historical walking tour, either, instead heading to the stand of rental bikes near the station. I had equipped myself with a map, and before long I was heading in the general direction of Friedberg. A very hot day, but the bike path was mainly in the shade, and when you get some speed up, there is always a breeze. Along the main road, then quiet residential streets leading to rural lanes with signs for home picked strawberries. 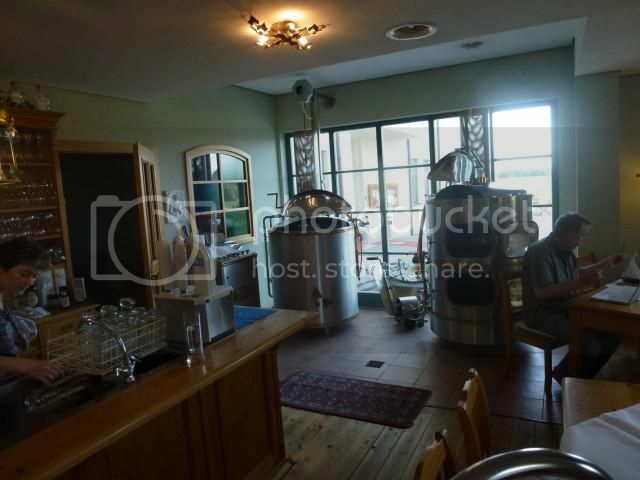 After about an hour I see my goal: the brewery, restaurant and hotel St. Afra im Felde. 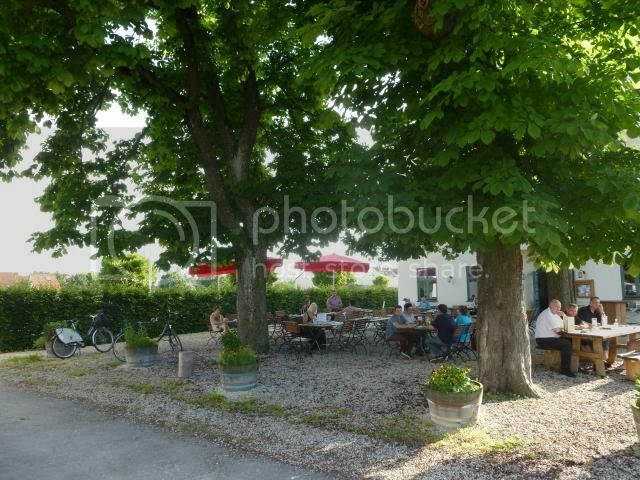 Tables under leafy chestnuts, views over wide fields, a rural idyll if there ever was one. Im Felde means in the fields, and here you sit under the chestnut trees im the middle of rows of ripening wheat and vegetables. And I am the only tourist to be spotted. Their house brew is an unfiltered Naturtrub Helles. Cereals, apricots, nice bitter feel as I lick my lips. Worth an hour each way by bike in a heat wave? 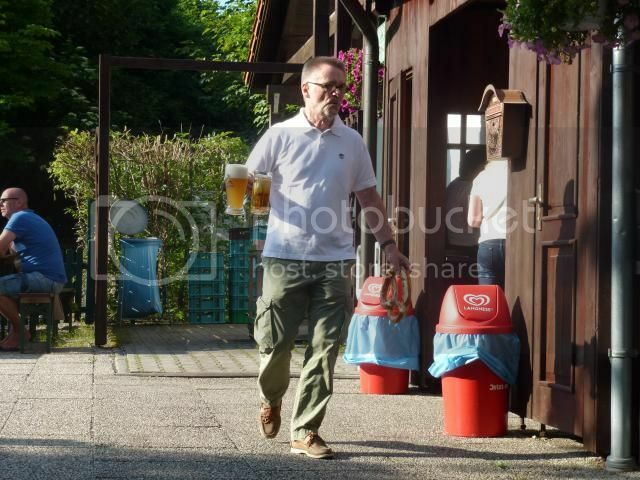 After 2 days in an Munich office, I needed the exercise. Additional beer offerings are from the Köbach brewery. Cosy interior as I peek in, the small brewing plant being right inside the door. This is the time to limit my intake to one beer, as I need to make the same journey back again. slightly faster going back. I don’t need to read the map, and the afternoon slides into a slightly cooler evening. Smack in the middle of Munich, a sones throw from the Glockenspiel, the Cathedral and all that, Schneider Weisse have set up a pub. Their brewery is not in Munich, but one cannot really blame them for wanting a part of the trade. 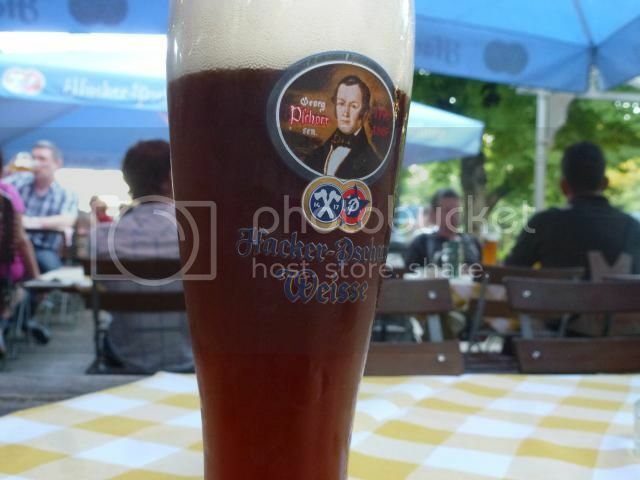 They are a very well respected brewery, particularly their Eisbock varieties have an international following. They are trying to think out of the box, cooperating with Brookly Brewery, trying out single malt wheat beers and so on. The tables in front of the house hardly count as a beer garden, but that’s the way it is. And they are hardly to blame for somone, probably the city authorities, digging up the street right in front of them. A few frightened bushes keep the cars away from the drinkers and diners. 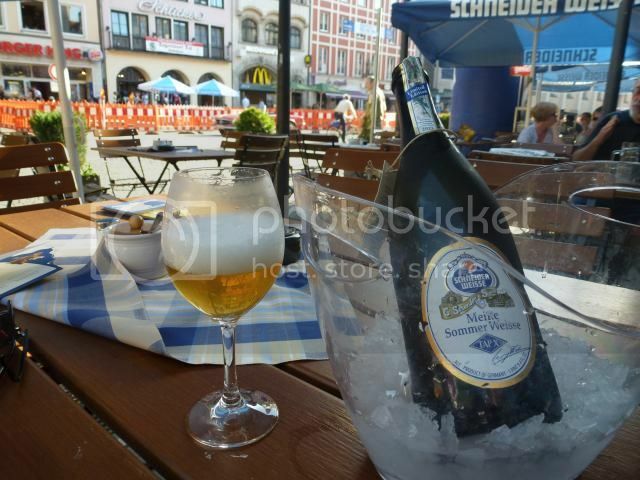 The posters surrounding their outdoor tables recommend trying their Sommerweisse. You realise this comes in a big bottle ? the waitress asks. It was not in the printed menu, though, and the ice bucket comes at a hefty price, as I discover when I ask for the bill. Should you have this one instead of lunch? Why not enjoy the exclusivity of this beer and then find a bakery shop that sells Brezl with cream cheese and chives for an Euro or two you’re on a tight budget? No need to seek out the American burger emporiums across the street when you’re in Germany. No Dirndl, no Lederhosen. Maybe inside, I did not look around. Yet another beer garden, this time a brewpub. They hand bottle a few of their beers, but you have to look up the retailers at theri web site. 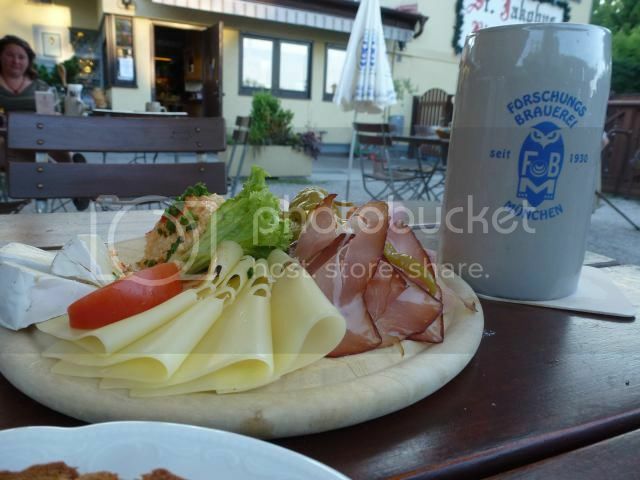 The Forschungsbrauerei means The Research Brewery, and they have been at it since 1930. I do not really know the results of the research, my sources tell me their beers are the same every summer. They are closed in the winter months. The Summer Hell comes in a ceramic mug, and it is fresh and hoppy, tingling a bit on the tongue. Fresh and hoppy for Bavaria, that is. Quiet in the early evening, friends chatting quietly. I order a plate of bread, cheese and cold cuts, and to wash it down, a Pilsissimus. More of a Dunkel than a Pils, I’d guess. Dark brown, rich and malty. 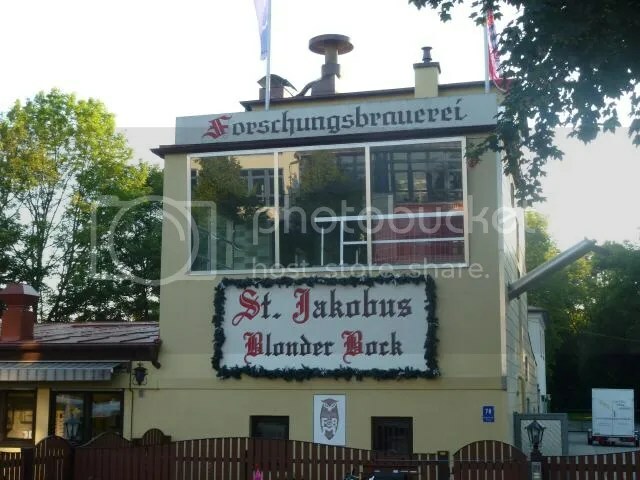 There is a Blond Bock and a Naturtrub Dunkel, too, though I did not try any of them. Good service, nice Dirdls, not far away from Central Munich. Not a must go, really. I have to admit I found this is a guidebook covering the best beer gardens of the region. It was (rather) conveniently placed, and it does not offer beers from the big players in Münich, but rather the smaller Erharting brewery, a brewery owned by the same family from the start in 1872. 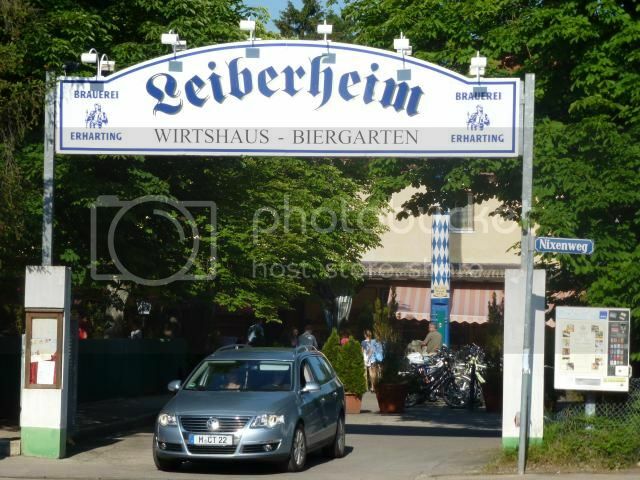 Leiberheim is located in the Southeastern suburb Neubiberg, I advise you to print a map before you start your expedition. The less techically challenged can probably find their way using their mobile phone. 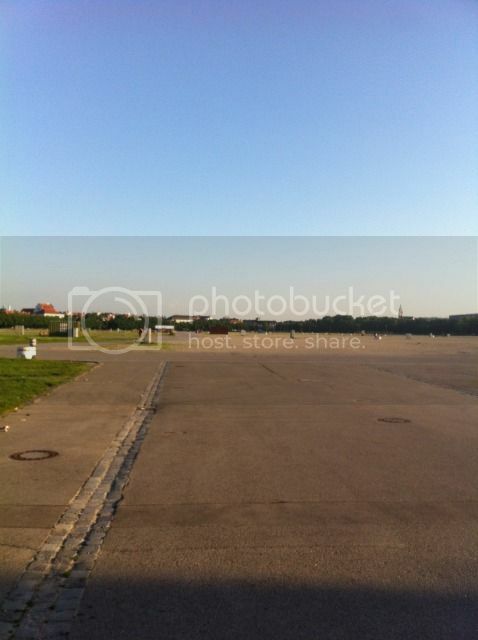 The sprawling Biergarten is in the middle of a residential area. No table service, at least not in the main garden, you place your order and pay at the counter. 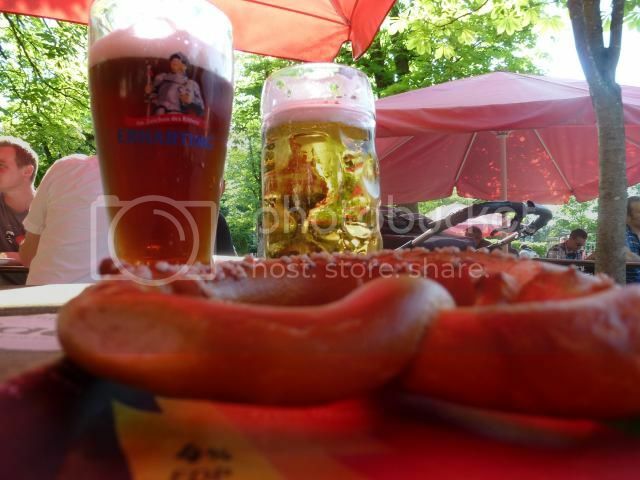 One peculiarity of the Bavarian beer garden law (yes, there is one, but it is far younger than the Reinheitwsgebot, is that people are permitted to bring their own food in the beer gardens. 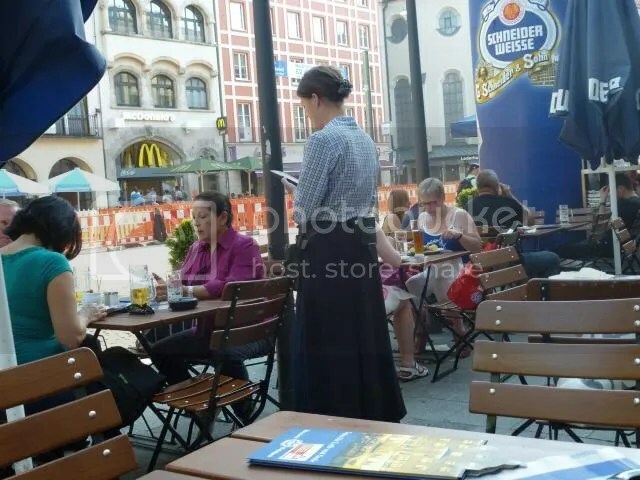 What you typically see is one area with tablecloths and cutlery, one with just plain wooden benches and tables. This means that families bring their own baskets, with the ladies arranging impressive displays of Tupperware boxes of homemade food. I go for two small glasses, wanting to sample two beers instead of just one Mass. I felt like a sissy, obviously, this is a place where the full liter glass is the custom. Ther Erharting Helles is nice and crisp. I’d call it a pilsener, but don’t tell anyone, they might have to take out the hops. Liquid bread, to use a cliché. The Erharting Dunkelweisse is sweet, malty, full bodied and earthy. But malty beers can be boring, the hoppiness would have been as welcome in this beer. Ten or fifteen minutes to the S-bahn station. Low Dirndl factor. If there were other foreigners around, they were not noticeable. No signs or menus in English or Japanese. Well worth the walk and the time. Bring along a book and spend the afternoon.